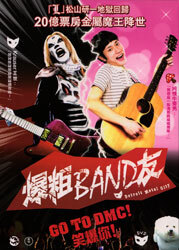 The Anime Archivist: Video Backlog: "Detroit Metal City"
I suppose it’s not too hard to see why DMC was a runaway hit in Japan. For whatever reason it seemed to have peaked in 2008 with the release of the (very underrated) anime and this live action film. While latter volumes of the manga have been rather lacklustre as author Kiminori Wakasugi seemingly is running out of ideas, the earlier material is hilariously funny, and luckily the film, like the anime, uses the best of this material. The manga is just not an excuse to present gross, foul and juvenile jokes. I read it as not only a satire on the metal music industry, but also self-conscious hipsters who spend most of their time up their own arses. Negishi is stuck between being adored as Johannes Krauser II, which he despises, and the hipster world which is disinterested at best when it comes to his corny pop songs. Not only are the metal fans depicted as gullible idiots, the hipsters are portrayed as shallow and latch on to anything which is “in”. While the anime took full advantage of crudeness of the manga, the live action film tones a lot of the material down. This is rather disappointing. The whole point of the manga was satirising the crudeness of death metal and play up its absurdness in how crude and shocking it is. Due to the short runtime of a film, a number of separate storylines are funnelled into one. Most of this occurs at the beginning of the film where Aikawa meets Negishi for the first time since school. The filmmakers merge this in with the manga chapter where Negishi goes on a date with her as well as trying to do an in store appearance with DMC. It’s also merged in with the chapter where Negishi has an altercation with DMC fans with Aikawa looking on AND where Aikawa goes to the DMC concert to do a report for the magazine she works for. There’s way too much going on to make the sequence successful and a lot of the jokes and parts which made these separate manga chapters work have been cut out. Strangely there’s also the deletion of the personality of Johannes Krauser II bleeding through into Negishi’s personal life. This is what makes the manga so funny. Apart from the merging of manga chapters and the sanitising of the material, the film makers have annoyingly (and predictably) decided to focus on the permanently stalled romance Aikawa and Negishi. Focusing on this romance is really missing the point of DMC. There’s also the deletion of a number of characters. Most notably the “Capitalist Pig”, Negishi’s neighbour and the Death Records president’s underlings. However amusingly her underlings have been replaced with dogs, which bizarrely works somehow. I have to make mention of Jack ill Dark who is infamously played by Gene Simmons in this film. Yes, he does sing “Fuckingham Place” in the film and the end sequence where he and DMC battle it out, complete with “the Beast”, is hilarious. The (over) acting can be quite bad at times, however Kenichi Matsuyama, who plays Negishi and Johannes Krauser II is fantastic in the role. Though at times he overacts when playing Negishi. Overall it’s your typical piece of commercial Japanese cinema. A lot of the original material has been sanitised greatly which is highly disappointing. I think a great opportunity has been missed here. They’ve decided to play it safe which is both frustrating and to be expected I guess. However the film can be really devastatingly funny when it wants to be. The Hong Kong DVD is a bit annoying as Chinese and English subs appear at the time same time despite the fact there is two separate Chinese sub tracks. 6.5 out of 10.